Synopsis (from the publisher's web site): Rafael is hungry - because someone stole his lunch. His mom had packed his lunch bag with two burritos, a bag of corn chips, some carrots, and an apple. Once a week she tucks in a slice of her special lemon pound cake. Rafael saw Kevin, a new kid in his class, sneak his lunch bag from underneath his desk and tuck it in his backpack. But how can he do something about the theft without picking a fight? Inspired by his mother's advice to "Use your mouth before your fists," Rafael bides his time, but other kids' lunches are disappearing, too. On an errand with his mom, Rafael sees Kevin carrying a bundle of laundry into a motel room, and his mom tells him Kevin's family might be one of the families who lost their homes in the recent wildfires. Rafael rethinks his anger. The next day, instead of accusing Kevin, Rafael invites him to share his lunch, letting him know he's been caught, but offering friendship as well as a good meal. Why We Like This Book: One of the best things about this book is the way Rafael interacts with Kevin. Beyond not taking any kind of violent approach against the lunch thief (using his words instead of his fists), or even verbally confronting Kevin to talk about the stolen lunches, Rafael's first real coversation with Kevin starts with "Hey Kevin. What's Up?" Then, Rafael asks Kevin where he's from and learns that Kevin is from the place where the recent wild fires had struck. Seeing Kevin's emotions clearly change after that revelation, Rafael knows enough to stop talking and give Kevin some space. When Rafael and his mother see Kevin going into a local motel shortly after that, he knows that Kevin must be having a very difficult time. Going beyond feeling sorry for Kevin, Rafael finds a way to befriend Kevin, first by inviting him to join Rafael and his other friend Alfredo for lunch, and then by offering to share his lunch with him. Another thing that is wonderful about the book is the way Rafael's body image is handled. Rafael is a little heavy compared to the other children in his class, even getting a little friendly teasing from his best friend Alfredo early in the book. His baseball coach also told him that it would be good for him to lose a little weight. So a benefit of sharing his lunch with Kevin was that he might shed a pound or two over time. Rafael's interaction with Alfredo can be compared to another interaction Rafael has with Kevin about his weight. In one the teasing is good-hearted, in the other, it is part of the bullying. Helping children learn the difference between friendly teasing and bullying is really important (including a child undertanding that even friendly teasing should stop should he or she tell the other person that it hurts). The story is compellingly told, with beautiful illustrations that truly help you see how each character is feeling. The illustrator obviously wanted to emphasize each child's face during the various interactions, to help readers understand not only what the words were saying in the story but the impact the situations were having on each child. Every interaction between the children, the teacher, and Rafael's mother provides a great learning opportunity, launching points for many different topics of potential discussion throughout. The publisher, Tilbury House, only publishes a few books each year and each is a gem. For each of their books, Tilbury House offers "Teachers Take Note" pages with lesson planning materials, suggested resources, and more. 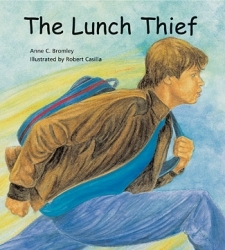 Click here to visit the Tilbury House page for The Lunch Thief. Books like The Lunch Thief are made wonderful by the people who write them and the people who illustrate them. Click here to learn more about Anne C. Bromley and click here to learn more about Robert Casilla (who recently illustrated a new book writen by Sarah Warren called Dolores Huerta: A Hero to Migrant Workers). This book is available from Reach And Teach. Click here to order it. We offer a wide variety of books dealing with the issues of homelessness, hunger, bullying, cultural diversity, and body image. Here are a few we'd like to highlight to go with The Lunch Thief. Rafael does get angry when his lunch is stolen in The Lunch Thief but he uses his words, after taking time to think about what he'll eventually say. This is a really great example of anger management, showing that the feeling of anger is OK, as long as you deal with it in a healthy way. Anger is something we all need to deal with, whether it is our own anger or the anger being expressed by someone we are with. Whether we are parents, teachers, youth-group leaders, counselors... anyone dealing with other people, anger is going to come up. Reach And Teach believes that it is critical for peacemaking and social justice that children learn how to deal with anger as early as possible. Of course we, as adults in their lives, can offer the best examples of how to deal with anger. How are you doing with that? Maybe this teach-in can help. Click here for the full teach-in article. The following are products recommended in that teach-in. Since The Lunch Thief focuses on homelessness and hunger, we wanted to share one more book with you that also touches on those themes. Reach And Teach published this wonderful children's novel about a girl and her father who are homeless in San Francisco. 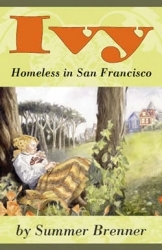 We will soon be launching a special web site called Project Ivy where children and teachers around the country can learn about the issue of homelessness from Ivy (as voiced by author Summer Brenner), get resources about homelessness, and find ways to take action. Plus, we will have a comprehensive study guide for teachers to use with the book in the classroom. Click here to read about the book and Project Ivy and order your own copy of the book. We also have a 5th grade study guide for teachers to use in the classroom that maps into language arts curriculum. The Ivy page contains a lot of links to resources for teaching/learning about hunger and homelessness. Now that we've introduced you to one of our favorite books, The Lunch Thief, and we've shared a lot of other resources, we'd like to ask you a few questions. Please use the comment button below to reply or click here to send us an email. What other books / resources would you recommend we mention when talking about this book? What is your favorite book that touches on the topic of bullying? What is your favorite book that touches on the topic of homelessness?